Recently I’ve been having to manage Toby’s laminitis and everything that comes with it! I’ve learnt a lot in the process! I’ve also been looking in the different types of disciplines in Western Riding and the classes in competitions (All in the ‘Learn More’ section). Laminitis, Sweet Itch and bored, fat Ponies! The one thing I have learnt from experiencing Laminitis is it’s not just Laminitis… It’s everything else that comes with it. Toby, like many other ponies, will get very bored when he doesn’t have much to eat. As a result of boredom, he rubs and scratches. Not a great combination for a horse on a restricted diet due to laminitis. I’ve had to cut his hay down, and he has small portions every 2 hours. Rather than one large one in the morning, as he would gorge and then have nothing until the night time. This did help him a little, but he would still have periods of boredom in between. Unfortunately, there wasn’t much I could do. Other than remove anything he could rub himself on, and potentially cause himself harm. I not only had guidance from my vet throughout this whole period, but also some great nutritional advice from specialists. Surprisingly, I was doing more harm taking Toby off a daily feed and cutting his hay rations down. Instead, I should have put him on a high fibre, low sugar diet… I know this sounds obvious, but how do I do it with a fat pony? Other things I had to deal with whilst Toby was on a bit of box rest was yukky feet, tipped over water buckets, trampled on rugs and anything else he could find to entertain himself! Thankfully, it wasn’t for long! After a short 2-week period, we were given the OK to start bringing him back into work, along with some turnout time. When returning him to turnout the first step I took was reducing his grass and replacing it with soaked hay and a high fibre feed and balancer. Giving him a feed at breakfast time meant he would gorge less in the grass paddock. He would then come in to a bare paddock where he has his daily hay allowance, before coming in for the night, so his turnout time doesn’t reduce, just his grass rations. Once the summer grass has finished, then I hope to start putting him out at night again, and this winter, I won’t be rugging him up as much either, making him use his body to keep warm. Although the laminitis seems to be a long distant memory, he now has possible sweet itch! His itchy areas are bathed with medicated shampoo every day, and have creams applied. He has a very snazzy sweet itch rug now, that he wears when he is out! His diet is going very well, and has lost a staggering 47kg, with only 4kg left to lose to reach his target weight. He looks so much better for it! One thing I learnt about overweight horses is how to spot the signs… and I’m not talking about the size of their belly! The obvious sign is a harder, cresty neck, which he definitely had. Also, the dipped area above the eyes (supraorbital fossa) bulges. I am pleased to say that Toby’s neck is a lot softer, his sheath is the most “defined” I’ve ever seen it, and the dip above his eyes is slowly improving too. If you do have any worries about your horses and laminitis do contact your vet. Having had the farrier out and the vet not seeing any cause for long term damage, I was able to get Toby back into work. Before I was allowed back in the saddle, I had to do 2 weeks of lunging, starting with 10 mins in the first week, and increasing to 15/20 mins in the second week. First time I lunged him, I expect some “yee-haa” moments from Toby. Especially as he hadn’t been out for a while, but nothing, not even a flick of the back leg. He lunged like he hadn’t had one single day off, what a gem of a pony! I varied his work too, some days I would use just his rope halter, and worked on ground work. Other days I would tack him up and lunge or use his training aid. Two weeks later, I got back on. Strangely, I thought I would have to prepare myself more. 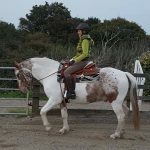 I suffered a lot with my confidence over the years and getting on a horse that hadn’t been sat on for almost 2 months would have really played on my mind. But not this time, much of this is down to all the groundwork I’ve been doing with Toby since training Western. Groundwork exercises can be applied to all horses regardless of what discipline they’re training in. I look at groundwork as the foundations of a house, without good foundations, the house won’t be very stable. It builds trust and respect between horse and owner. I eventually booked in another lesson with my trainer, something I have really missed. I rode in the shank bit, and Toby once again, felt amazing. It was a slightly different mouth piece this time. It has a port, like the first one we tried, but it was slightly higher and wider. Toby went even better in this one, and I was so pleased to be back in the saddle. We are still struggling with the itchy skin that he has. We have the vet coming back to have a look, and maybe take some bloods/samples. In the meantime, I will keep him ticking over, and not push him too much with the exercising, especially in this heat wave! For anyone managing a horse with lamnintis always get advice for a vet or equine specialist, they’ll provide the best advice for getting a horse back into work with laminitis. Western Pleasure is a competition at horse shows. During the competition horses are evaluated on their manners and Gait. For the gait they’re looking for a relaxed but collected gait rhythm and relatively slow speed. The horse is also expected to be calm and responsive disposition. The horse’s outline is very different to that of a Dressage horse, much lower and relaxed looking. But they’re judged much on their way of going, much like a Dressage competition. 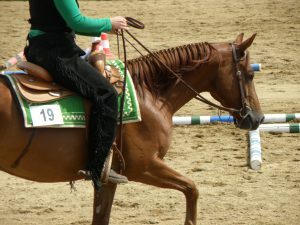 Reining is a competition in which the horse performs a series of movements. These include a pattern of circles, spins & stops. All work is done at the lope (relaxed version of canter ), or gallop. Trail is a competitive class where horses and riders navigate a series of obstacles. Contestants ride the course one at a time. Originally designed to resemble situations a horse and rider might encounter when on a trail in a natural habitat. The modern trail classes now tend to focus more heavily on agility and manners, with courses bearing very little resemblance to real-world natural trails. A typical trail course requires horse and rider to open and pass through a small gate while mounted; walk across a fake bridge; cross over a set of rails or logs at a walk, trot or lope; back up, often with a turn while backing; side-pass, often over a rail or log; turn on the forehand or hindquarters within a confined area; and tolerate some type of “spooky” obstacle. The horse is asked to perform all three gaits in the process of completing the course. Cutting competition in which a horse and rider work as a team before a judge or panel of judges. They demonstrate the horse’s athleticism and ability to handle cattle during a two-and-a-half-minute performance, called a “run.” Each contestant is assisted by four helpers: two are designated as turnback, they help to keep cattle from running off to the back of the arena. The other two are designated as herd holders to keep the cattle bunched together and prevent potential strays from escaping into the work area. A contestant is required to make at least two cuts from the herd. One of which must be a cut from deep inside the herd, while the other(s) can be peeled from the edges. 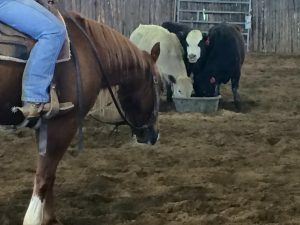 Once the selected cow has been driven clear of the herd, the contestant commits the horse by dropping the rein hand to feed slack and give the horse its head. At that point, it is almost entirely up to the horse except for allowable leg cues from the rider to prevent the cow from returning to the herd. A job the best horses do with relish, savvy, and style. Judges score a run on a scale from 60 to 80, with 70 being an average score.